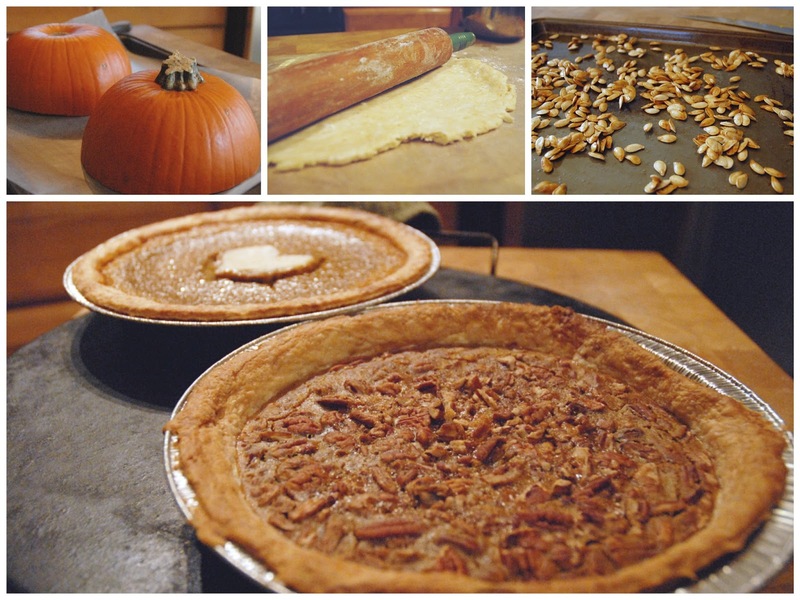 Making a pie from scratch really isn't as scary or time consuming as you might think. Of course it's easier to buy a pre-made pie from the store, but maybe not as satisfying. The great thing is that you don't have to set aside hours to make pies, you can do everything ahead of time and at different times. So impress your guests this year with your very own homemade pie. 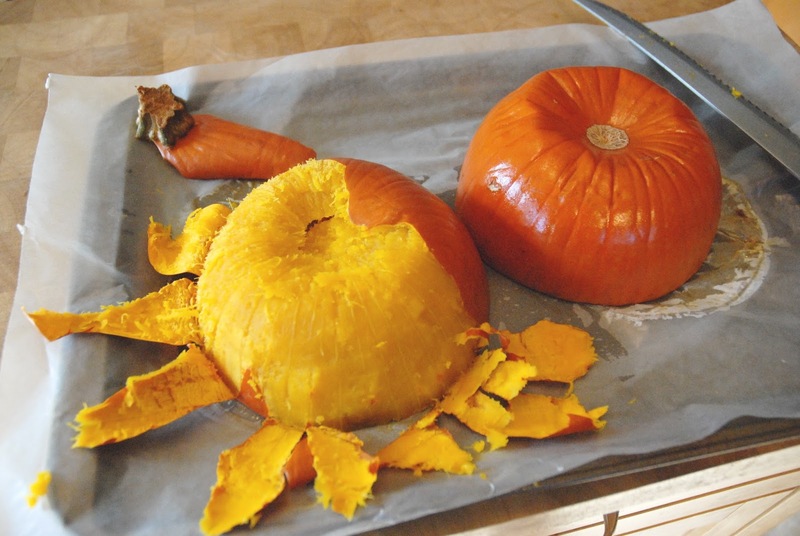 Start by washing your pumpkin and then cut it in half. 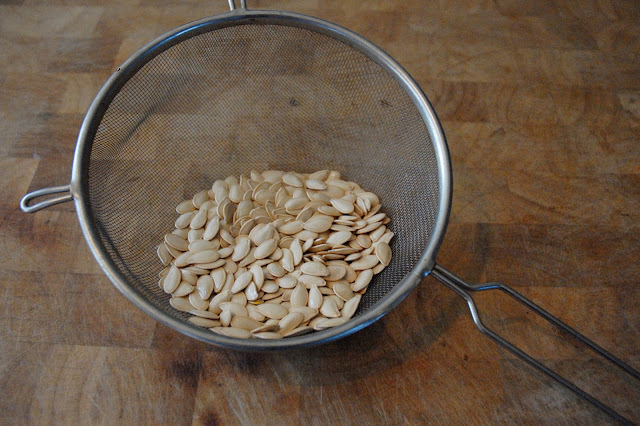 Use a spoon to scoop out the seeds and set them aside. 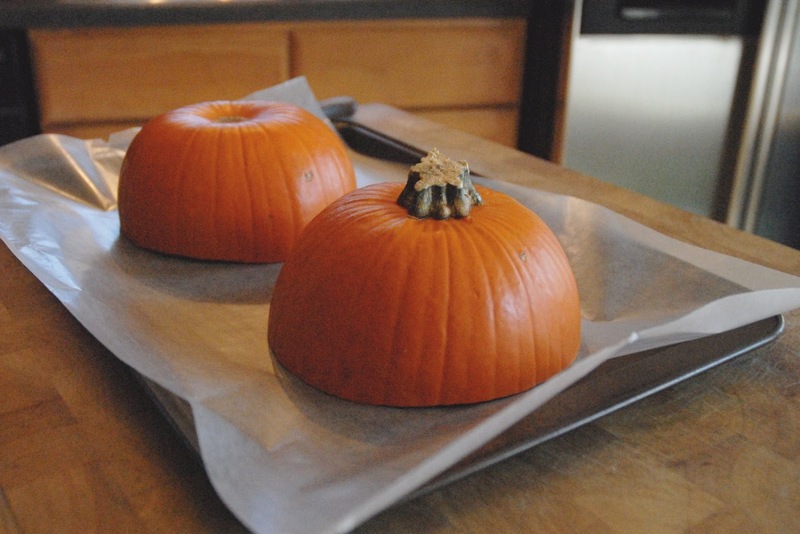 I placed the two pumpkin halves on a lined baking sheet and baked for 45 - 50 minutes at 350 degrees. You'll know when it's done if you can easily pierce it with a knife or fork. 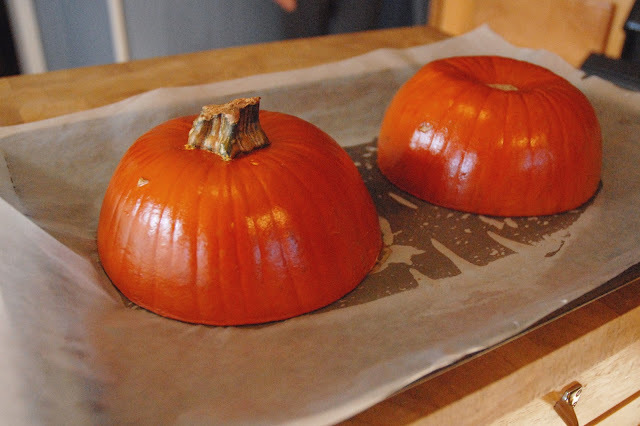 It will turn a bright, glossy orange while in the oven. When it's done, let it cool for a few minutes and then you should be able to easily peel off the skin. 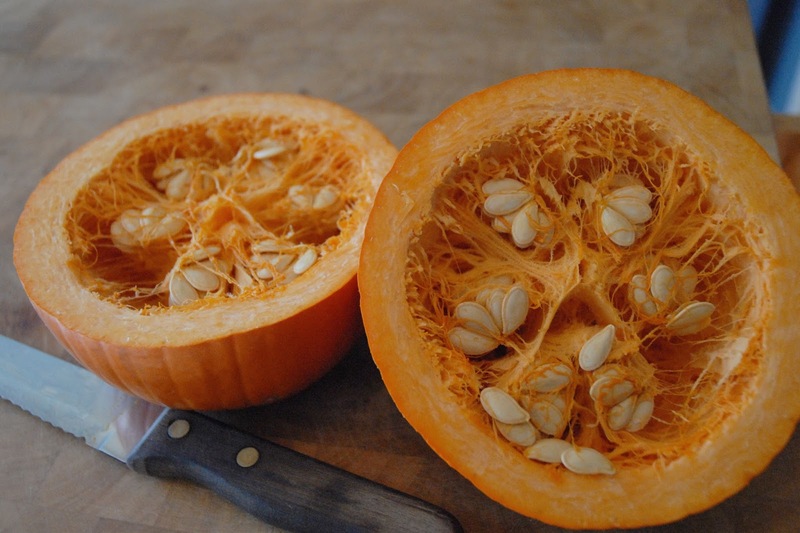 Use a knife to cut away any stubborn skin. Now your pumpkin is ready to mash. I mashed mine down in a plastic container to use later. Now that you have all those seeds laying around, make a snack! 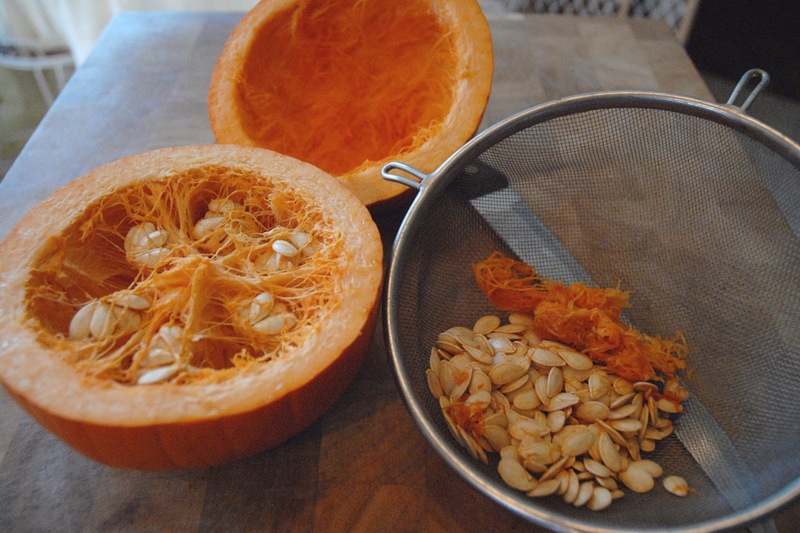 Rinse the seeds and remove any pumpkin left on them. It's pretty easy to do this by just stirring the seeds with your hand while running water through them. 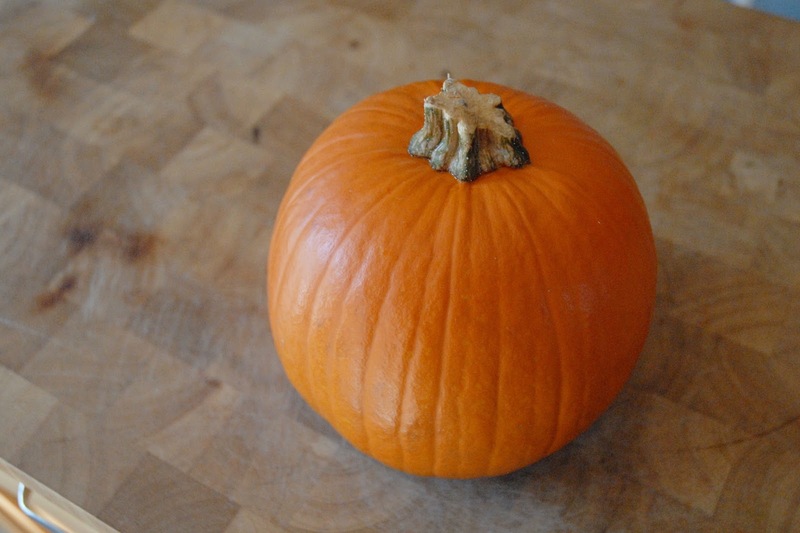 The pumpkin will usually stick to your hand. 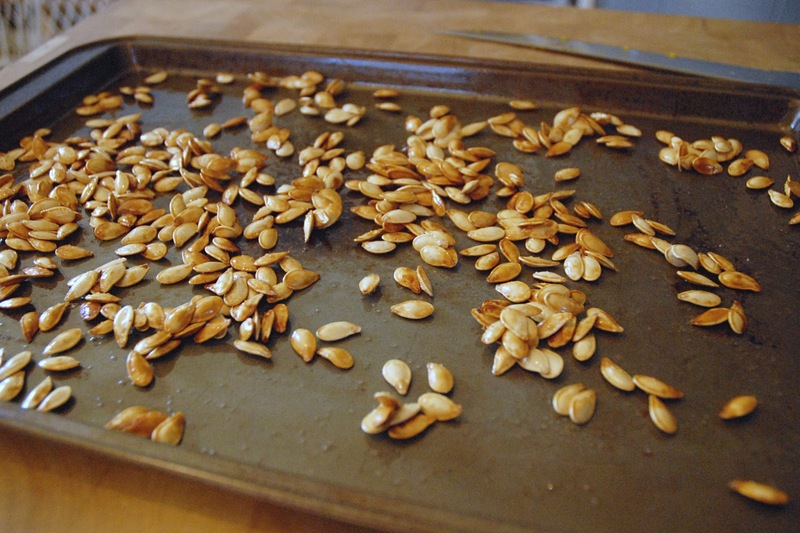 After the seeds are rinsed, let them dry a little and then spread them on a baking sheet. I like to season my seeds with a little drizzle of coconut oil and honey. Stir the seeds so that they are all coated and add some salt. Then bake at 350 degrees for around 10 minutes but check them often. They burn easily. You'll know they're done when they start to turn golden brown. I usually take them out and stir them around half way so they brown evenly. You want your oil or butter to be cold but not too hard. You don't want it to mix in smoothly so butter right out of the refrigerator is probably fine. I keep my coconut oil at room temperature, and this time of year it usually stays a creamy solid texture that worked perfectly. I like to use coconut oil because it makes a nice light and crispy crust. Mix your flour, sugar, and salt together and then add your oil or butter. 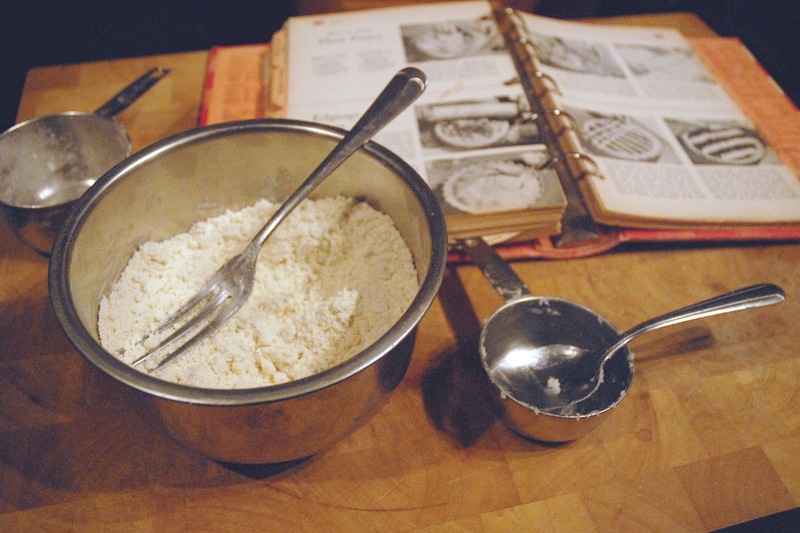 Use a long pronged fork to cut the oil into the flour mixture until it reaches the consistency of slightly clumpy cornmeal. Then add the cold water one tablespoon at a time by sprinkling it over the mixture and then stirring before adding the next tablespoon of water. 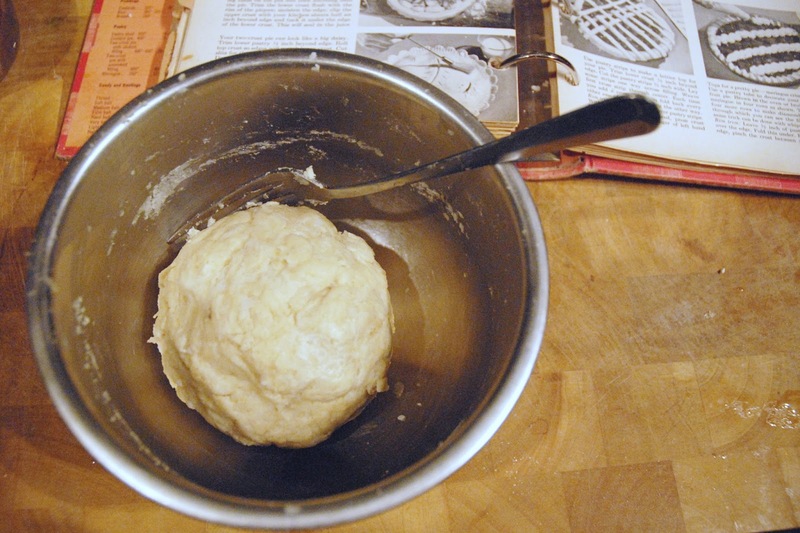 Do this until you can form a ball with the dough using your hands. This took about 5 and 1/4 tablespoons for me. Let the dough stand for a few minutes before using. 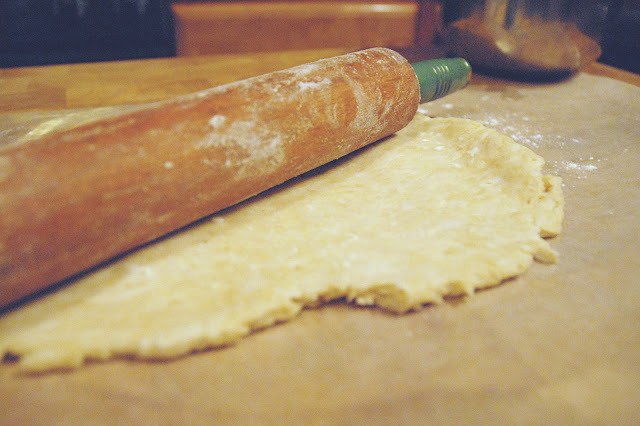 Now you are ready to roll your dough and either use it immediately or roll out on wax paper and then roll the paper into a scroll and put in the refrigerator or freezer for later use. Add about 2/3 cup (or to taste) pecans to the prepared pie pan before pouring in the pumpkin filling. Then sprinkle with brown sugar. *I didn't have whole milk so I used 1 cup of 1% and 1/4 cup heavy cream. You could also probably substitute for whole coconut milk if you need it to be dairy free. 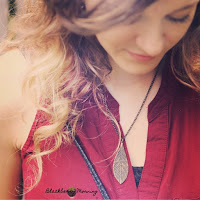 **A scant measurement is a measurement that is not quite full. I used 1/4 cup measurement that was slightly less than the full 1/4 cup of each: Brown sugar, white granulated sugar, and molasses. 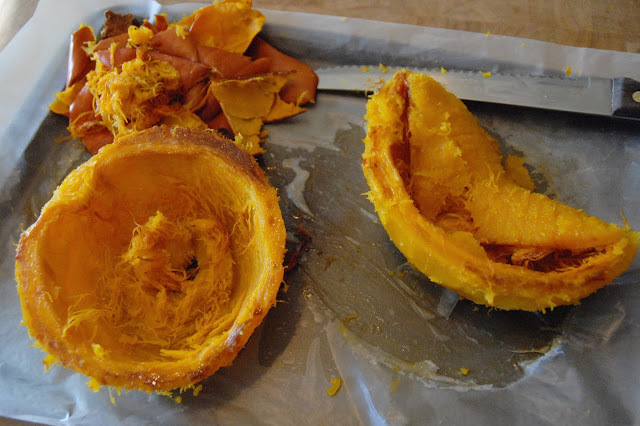 Since I didn't puree my pumpkin after cooking it, I decided to puree and mix my pie in one step by mixing everything in a blender. I started by adding the pumpkin, milk, and eggs and blending before adding the dry ingredients. Then I added the rest and blended again to mix everything together. 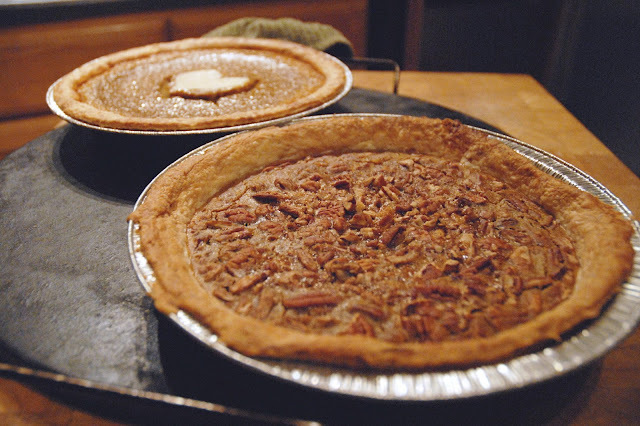 Then I simply poured the batter into my prepared pie pans and baked at 400 degrees for about 40 - 50 minutes. You'll know it's done when it darkens in color and if a knife inserted half way between the crust and the center comes out clean. This recipe makes a pie that is sweet and spicy. Feel free to add only 2 teaspoons of spice if you like a more mild pie. 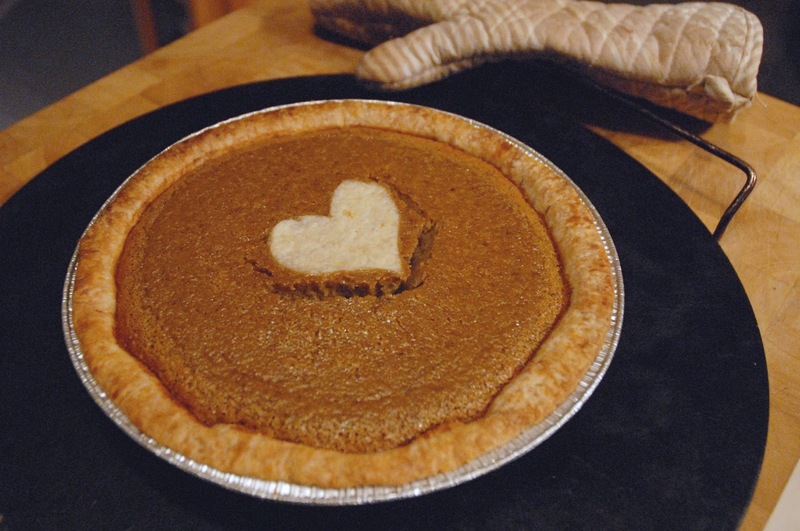 Side note: the batter is quite thin at first so I cooked the pie for 30 minutes before adding the heart in the middle.